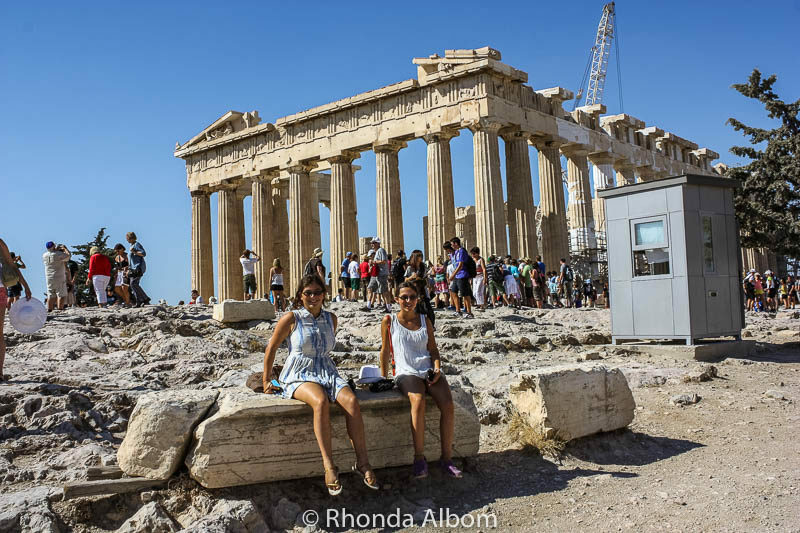 One day in Athens is all cruise ship passenger have to explore the historic sites of the ancient empire and the modern portions of Greece’s capital city. The list of key places to visit in Athens includes significant landmarks, culinary delights, and both ancient and modern art. 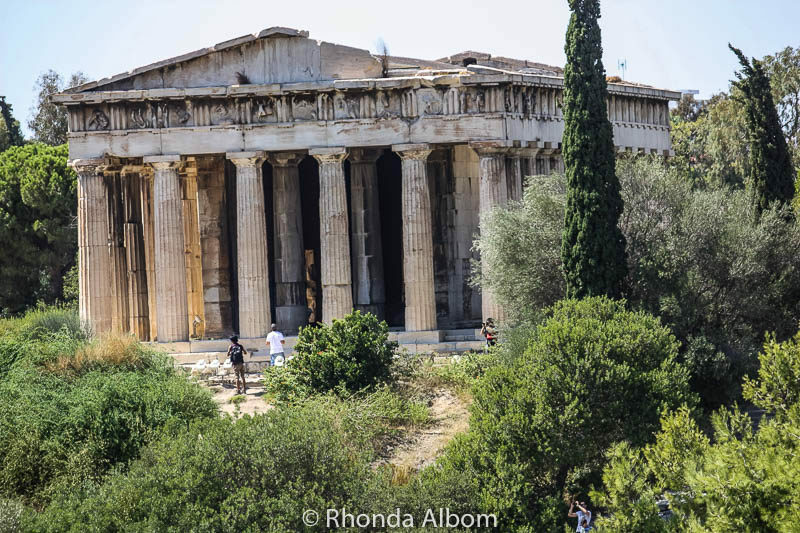 Despite the time restrictions, we managed to see many of the highlights in only one day in Athens. 3 Did we see all of Athens in a Day? 5 What would you see if you only had one day in Athens? One of the views from the Acropolis. 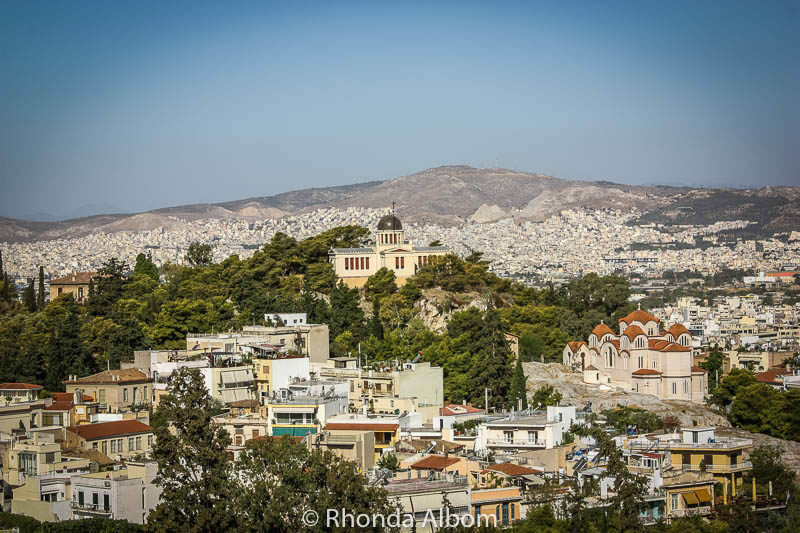 The domed building in the centre of the photo is The National Observatory of Athens. First, the list of best things to do in Athens will be slightly different for each person. To create your “top things to do in Athens Greece” list, start with informational pages like this one, written by people you trust. This page represents what we believe are the top Athens attractions. Next, take notes. Then, get yourself a guidebook that you can carry on the ship where you might not have access to the internet. While each of these books has good ratings, we personally recommend Rick Steves Mediterranean Cruise Ports. Next, we reviewed the excursions offered by the ship to see if any of them went exactly where we wanted to go. We generally opt for independent shore excursions, as they cost less, do more, have smaller groups, and are more personal. The ship’s tours often start more than an hour after arriving in port, have large groups, are impersonal, and frequently include a shopping stop where the ship earns commissions. As none of the tours exactly met our needs, we opted for one of the private tours in Athens Greece. 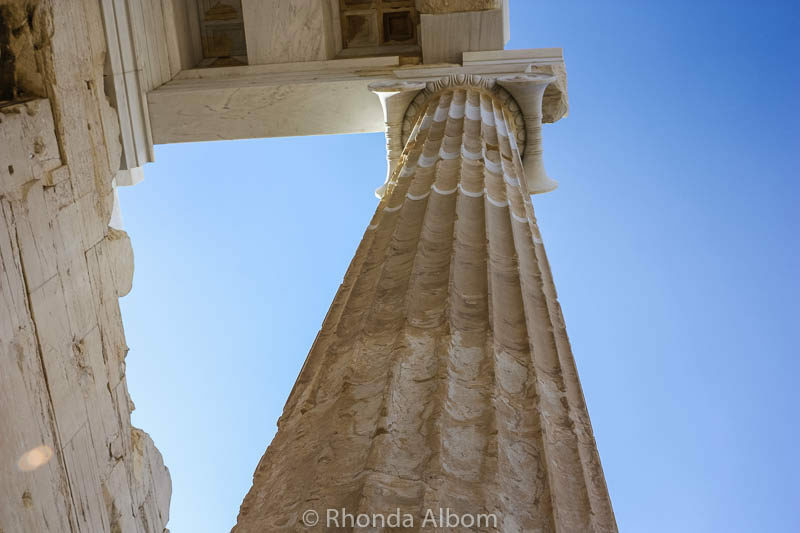 We created our own Athens itinerary with input from our guide. For us, this was the ideal option. Note: At the time of writing, only licenced guides were permitted to enter the venues with clients. 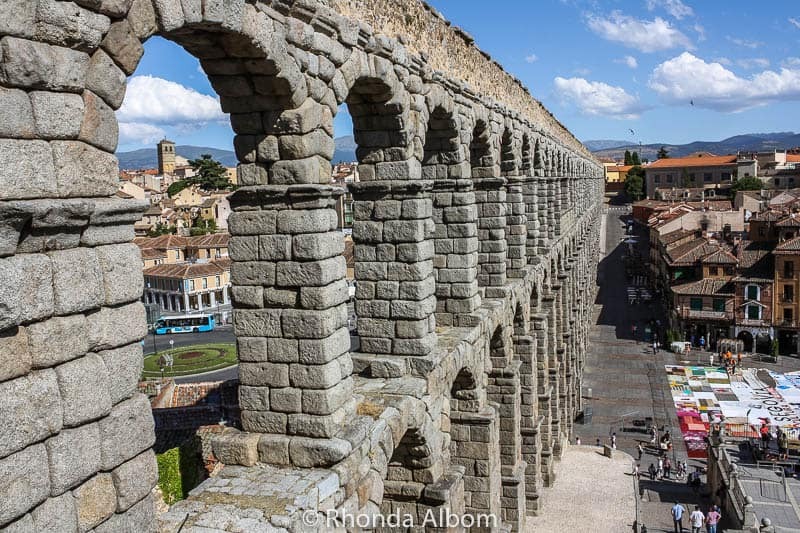 *Viator, a TripAdvisor company offers a worry-free shore excursion guarantee with some of their shore tours (be sure to read the details on any trip you choose). Our first stop was the Acropolis, which means “high city.” We walked past several ancient structures before coming to the most famous ones. We came here directly from the port and were ahead of the horde of tour buses that were arriving before we left. We arrived somewhat early to beat the crowds, it only gets worse as the day went on. 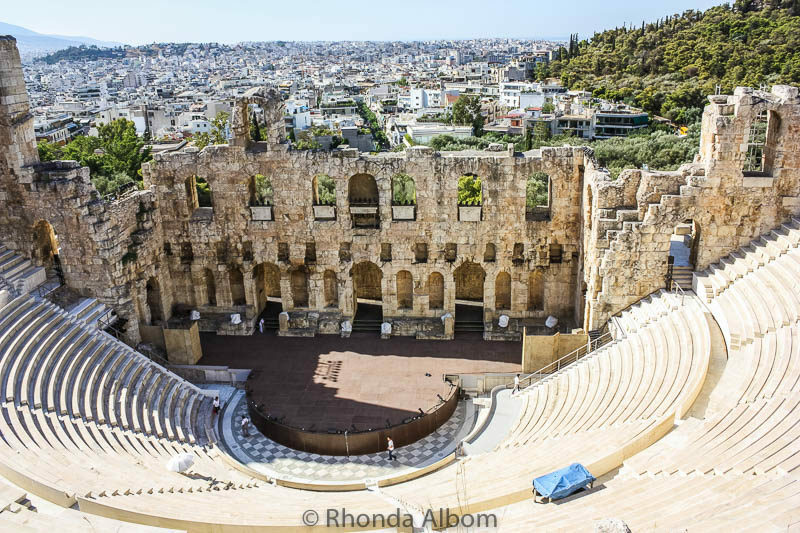 The Odeon of Herodes Atticus is a stone theatre built in 161 AD (renovated in 1950). A broken column shows that they were built in sections. 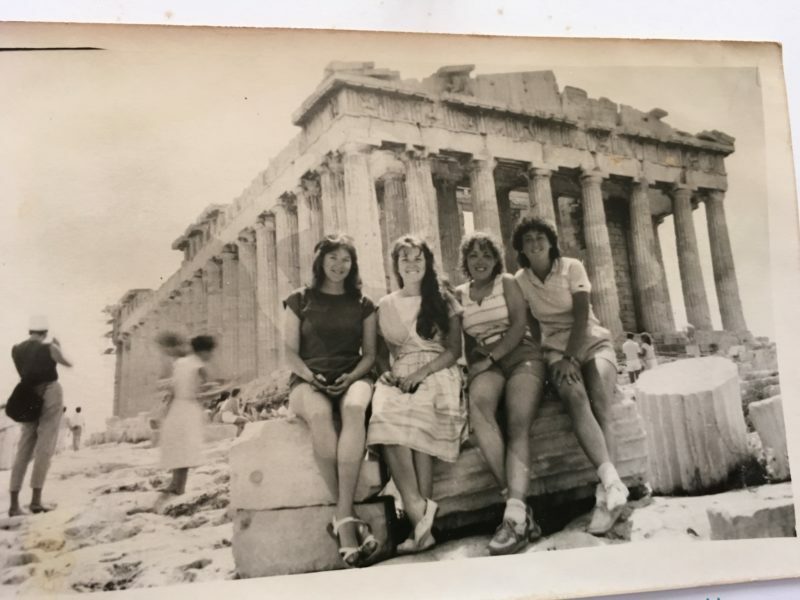 Our girls sit on an old column in front of the Parthenon, a former temple dedicated to Athena. Located on the Acropolis, this spot holds personal significance to me as I sat in this spot 30 years ago. This image was taken over 30 years ago, sold to us as a postcard, and then mailed home. I am the third from the left. 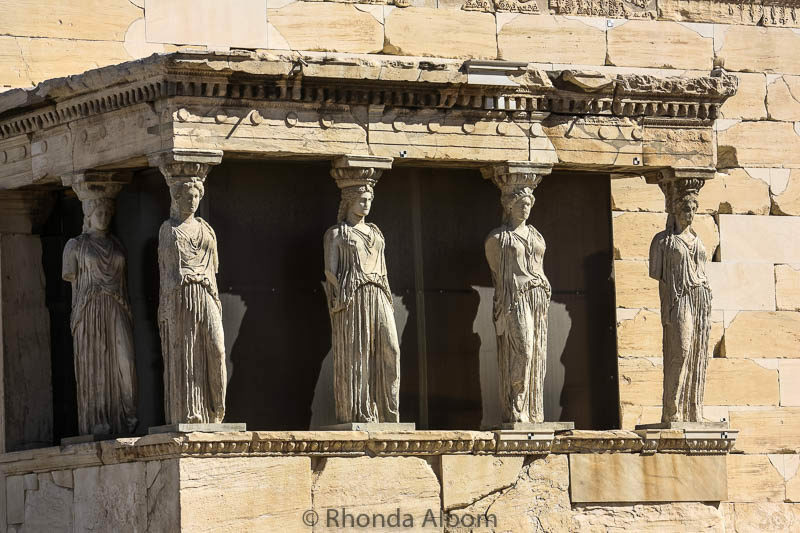 The Erechtheion (Erechtheum) is an ancient Greek temple dedicated to both Athena and Poseidon. 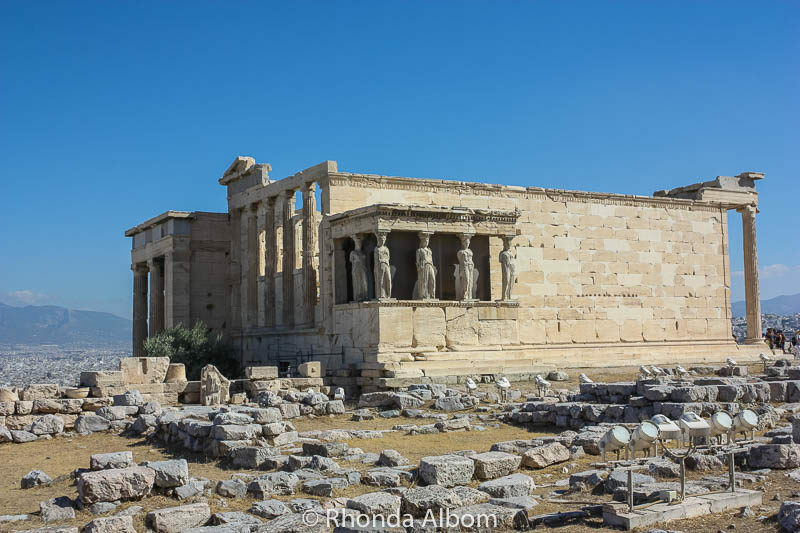 A closer look at Erechtheion. A rare photo of hubby and I. 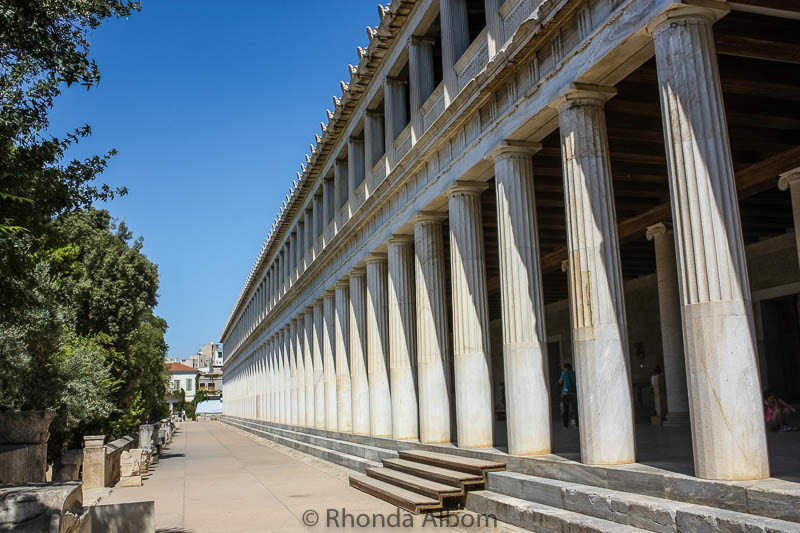 This is the Stoa of Attalos at the Agora, a rebuilt ancient shopping and gathering place. The Stoa of Attalos now houses a museum filled with ancient statues and mosaics. 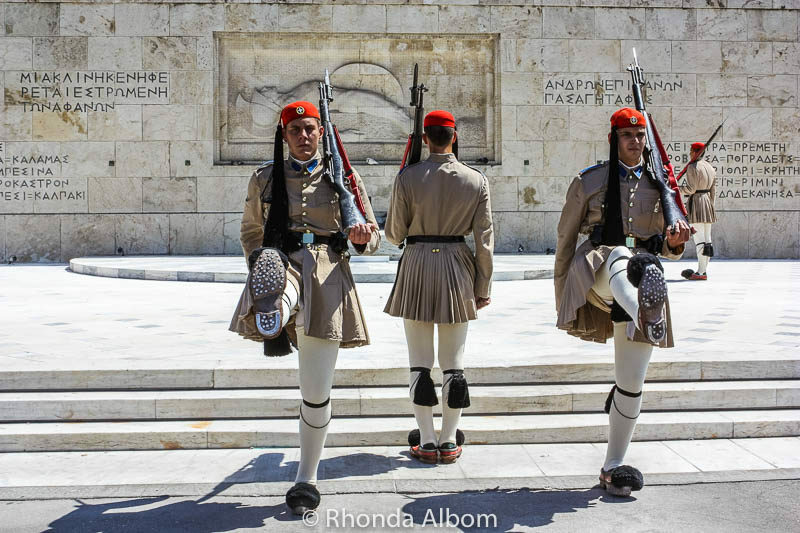 Changing of the guards at the tomb of the unknown soldier, in Syntagma Square (the central square of Athens), just outside of the Greek Parliament building. With limited time, we didn’t walk behind Parliament to enjoy the 15 hectare National Gardens. We enjoyed the National Archaeological Museum of Athens. It was a difficult choice between it and the Acropolis Museum, but we opted to see artefacts from all over Greece as we had already stood upon the Acropolis. As a bonus, the air-conditioned museum was a refreshing break from a blistering hot day. While we ate a traditional Greek souvlaki lunch, we didn’t take photos. However, we did get some delicious shots from our morning tea. The Temple of Olympian Zeus (Olympieion) is a former colossal temple. The Panathenaic (Olympic) Stadium is the only stadium in the world built entirely of marble. It has hosted three Olympics: the first modern Olympic Games in 1896 and again in 1906. Plus it was used for events of the 2004 Olympics. Our girls had a chance to run on the track. 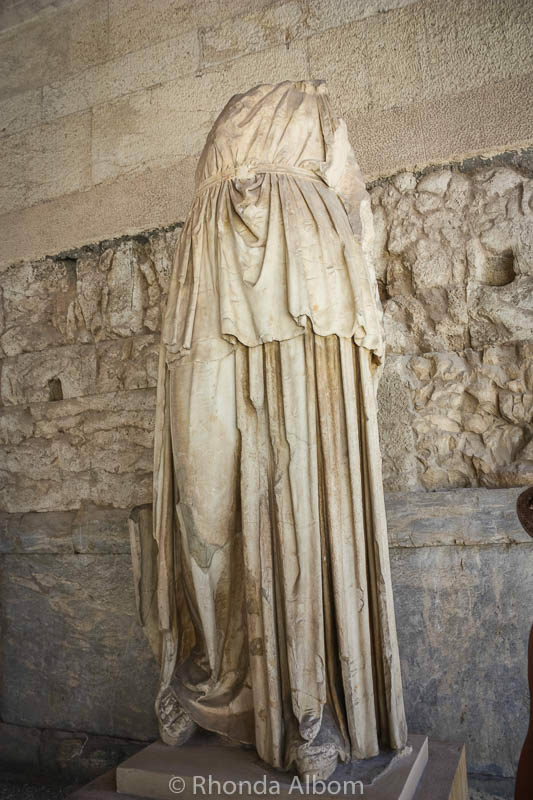 The goddess Athena, whom the people of Athens considered their patron. 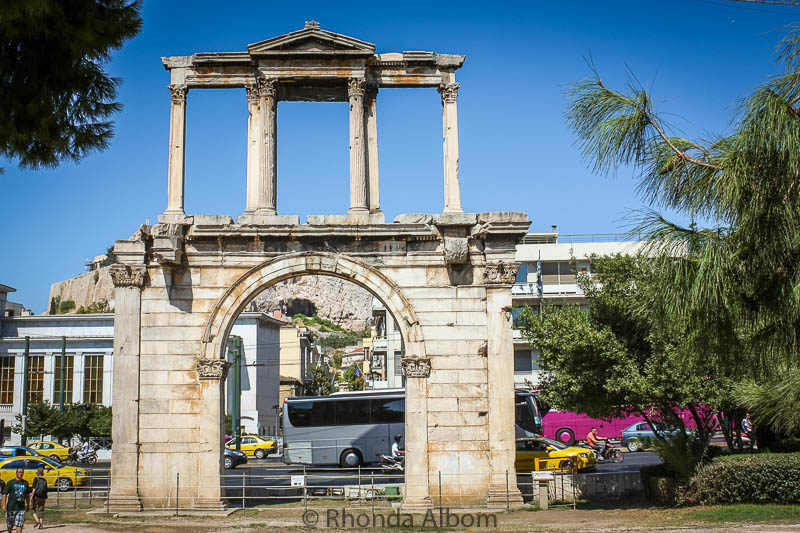 Hadrian’s Gate was possibly built to celebrate the arrival of the Roman Emperor Hadrian 131 AD. Did we see all of Athens in a Day? Walk the labyrinth of streets and have a coffee or meal in the old historic Pláka neighbourhood. Shop in the Monastiraki district. Stare in awe a the ruins of the Theatre of Dionysus Eleuthereus. Imagine participating in one of the Athenian assemblies at Pnyx, and being a part of the creation of democracy in 507 BC. Study the columns and architecture at the ruins of Hadrian’s Library created in 132 AD. 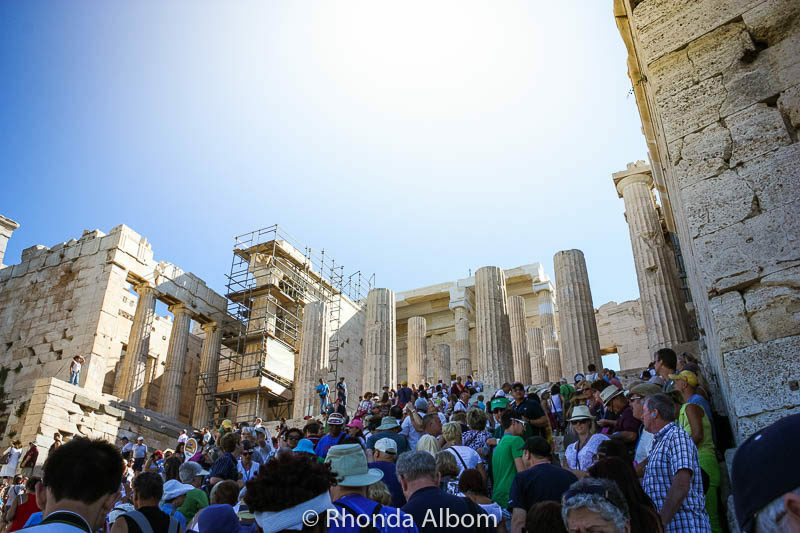 Visit the Acropolis as early in the day as possible as the ticket queue gets over an hour long. When at the Agora, or probably at any of the ruins, do not take a photo standing behind one of the headless statues to give the appearance of your head being on top of the statue. The guards will come running and stand over you until you delete the photo – I know this first hand. There is a big difference between hiring a private driver versus hiring an official guide. A driver can only take you to destinations, tell us about them while outside, but cannot enter with you. If you visit as a cruise port and enjoy Athens as much as we did, you will probably want to return for a longer visit. When you do, check for the best hotel pricing at Booking.com. Get out to at least one of the Greek islands. We went to Mykonos. The relaxed atmosphere and stark white-washed buildings offered a sharp contrast to the fast-paced Greek capital of Athens. 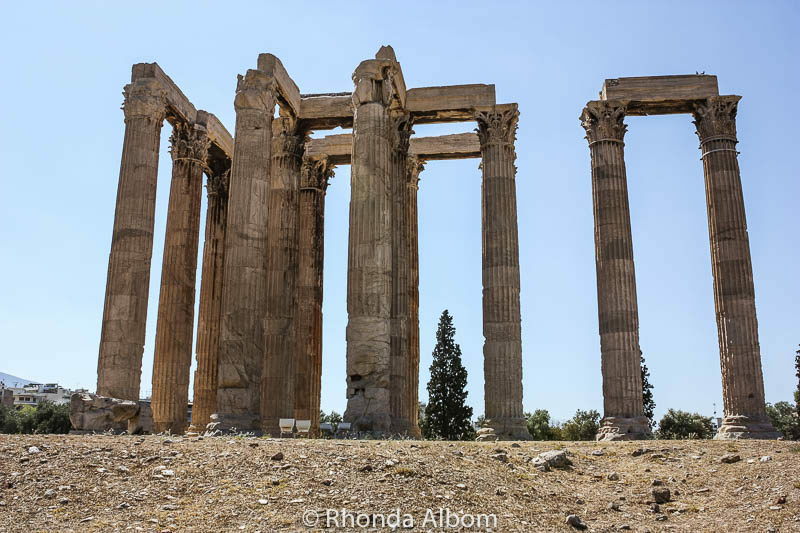 Many of my Greek images are available for purchase at Zazzle. 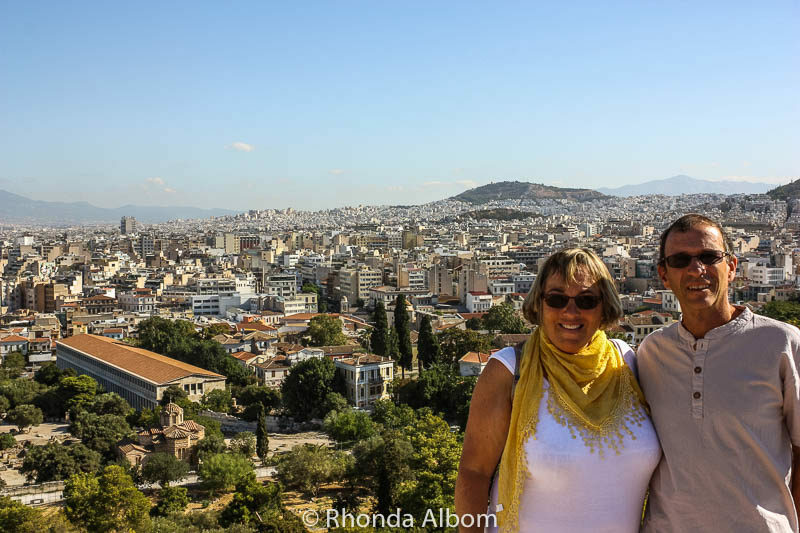 We visited Athens as one of nine ports as we cruised the Mediterranean on the NCL Spirit. We arrived in Athens after my favourite destination from this cruise, the historic and picturesque ruins of Ephesus Turkey. From Athens, we cruised into Venice Italy, our port of disembarkation. The ports included one port in France, four in Italy, two in Greece, and two in Turkey. 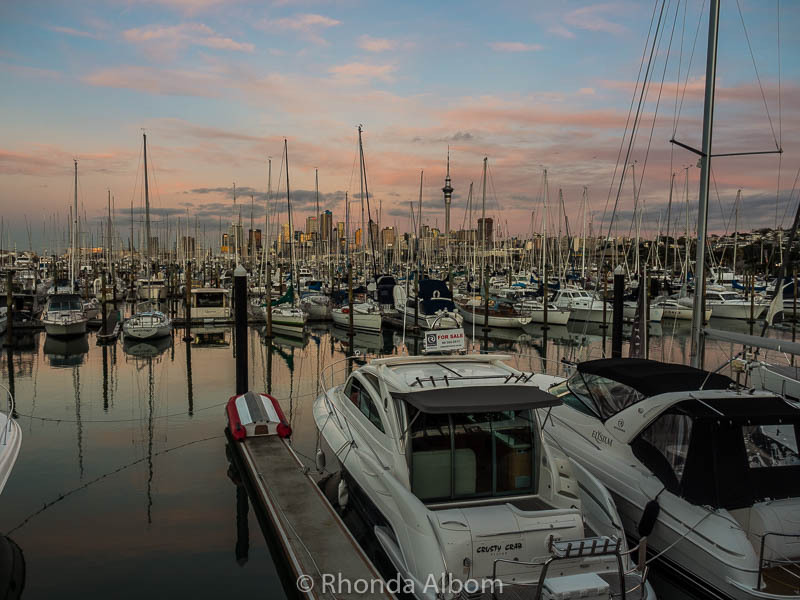 If you are heading out to sea, read next: 25 Tips for Cruising that Everyone Should Know. 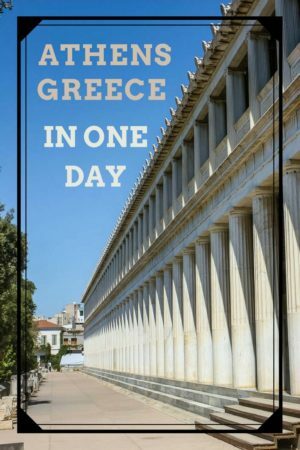 What would you see if you only had one day in Athens? If I had one day in Athens I would see the Acropolis and on my way down go to Anafiotika, my favourite neighbourhood in Athens, and then the Archaeological Museum. Fabulous photos Rhonda I just booked my flights for Greece for a month next May/June. Love the old shot of you at the Acropolis. The photos have really helped me to decide to actually spend 3 days in Athens as there seems there is more than enough to see. There is lots to see. I only had one day off a cruise ship. I would have liked to spend more time there. As other commentators have said, one day is never enough time. But saying that, itineraries like this one, do help in maximising your time in a city. I’d love to visit Athens one day. Thanks Mike, and I agree, planning is the key to limited time – that and a driver. One day is never enough, but sometimes you have no choice! I’ve been in this situation before. It’s amazing to make the most of your time and know that you’ll have other awesome spots to return to someday! Very true, and we always try to make the best of it when it happens. Now this brings back memories. You covered a lot of the same territory I did in one day on my trip to Athens. I love the idea of hiring a private guide to take you around. You get to choose your own adventure that way! That is exactly why we did it. I am lucky to be married to someone with very similar interests, so we can custom to accommodate both of us. 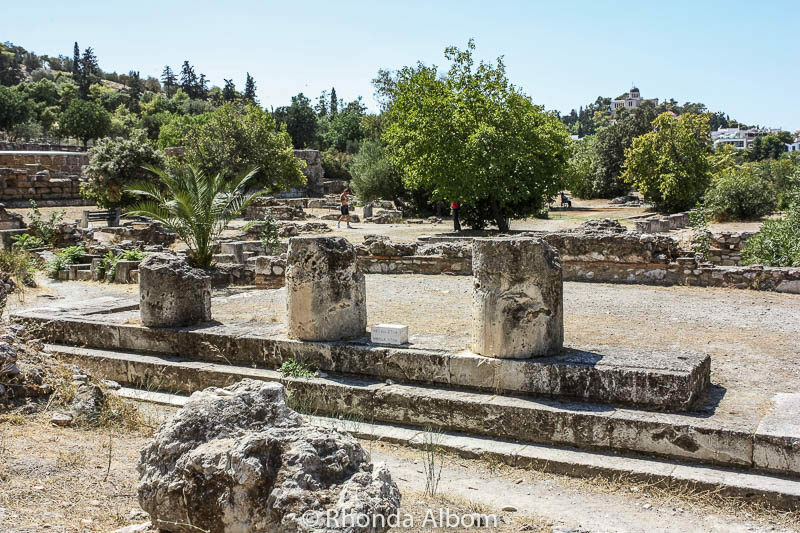 I really enjoyed this post, you know how much I love cruising but the downside is that they leave you one day to see so much so this post its perfect to refer back if I go to Athens in the future. I loved the picture of your girls sitting in the same post as you 30 years ago, how lovely! Wow, so much to discover in ATHENS in one day! I cant believe how many people were there at the Acropolis! it s certainly a great city. I pass by almost every year for a day on my way down to the Greek Islands, so I have seen most of these sites. Sometimes we look at photos and think “It didn’t feel that crowded”, but the Acropolis did feel like that many people. We generally prefer leisure and lots of time to explore, but sometimes all we have is one day, so we pack it all in. Love your photos. It looks like the weather was beautiful when you visited. 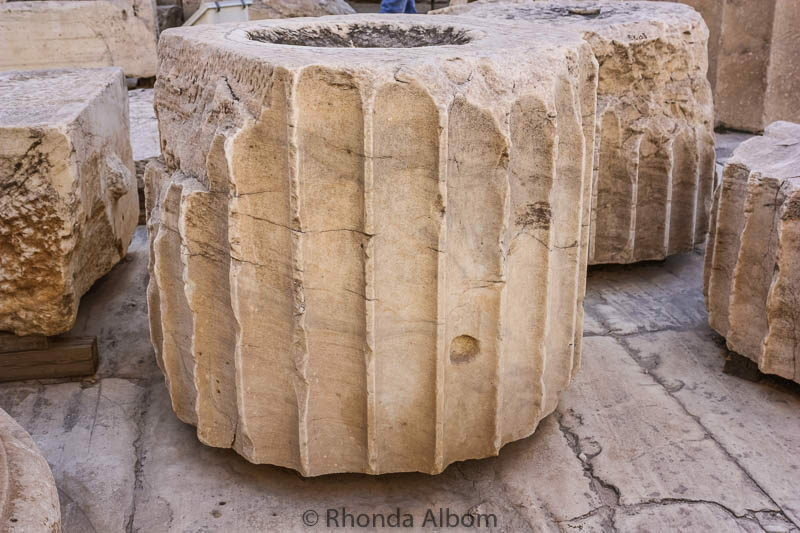 Athens is one of those cities steeped in history and mystery. 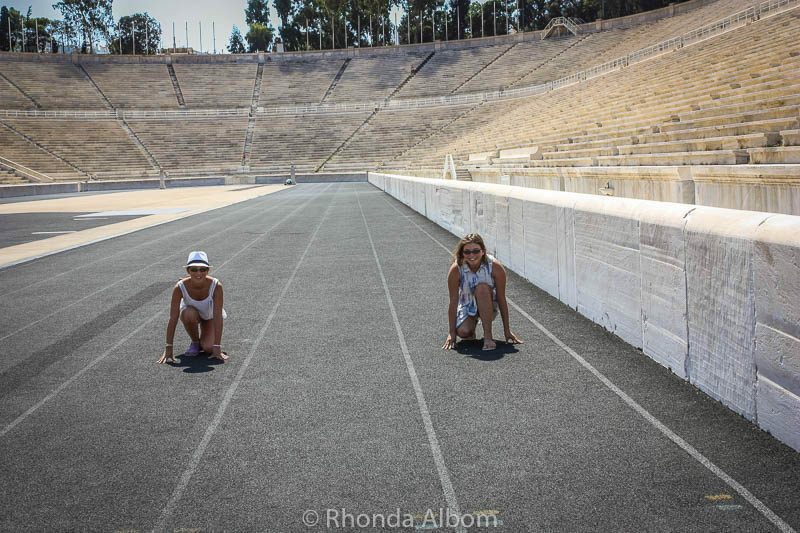 And I’m sure your girls will always remember their visit to Athens, especially the chance to run on the track in the Panathenaic Olympic Stadium. I know, how cool that they got to run on that track, and stand on the podiums. Reminds me how I really need to go back to Athens. I haven’t been for years and really haven’t explored properly! I don’t feel that I explored it properly either. I think your tactic of advance planning and booking a private driver and car was wise, to allow you to pack in as much as you could into the time. And getting off the ship amongst the first on arrival to port probably helped you to beat some of those crowds at Acropolis too. I went when I was four, over 4 decades ago, and there’s a photo of me on that same fallen rock somewhere in our family albums. I’ve not been back (yet) though. We pre-arrange for private drivers often when we travel and have limited time in a city. Especially from a ship. Even the expensive driver is often cheaper than paying for four people on an excursion. We spent 3 days in Athens and I would say that was plenty before leaving on a tour. Our hotel was directly across from the Parliment. Oh I remember those tourist postcards that were mailed to us. 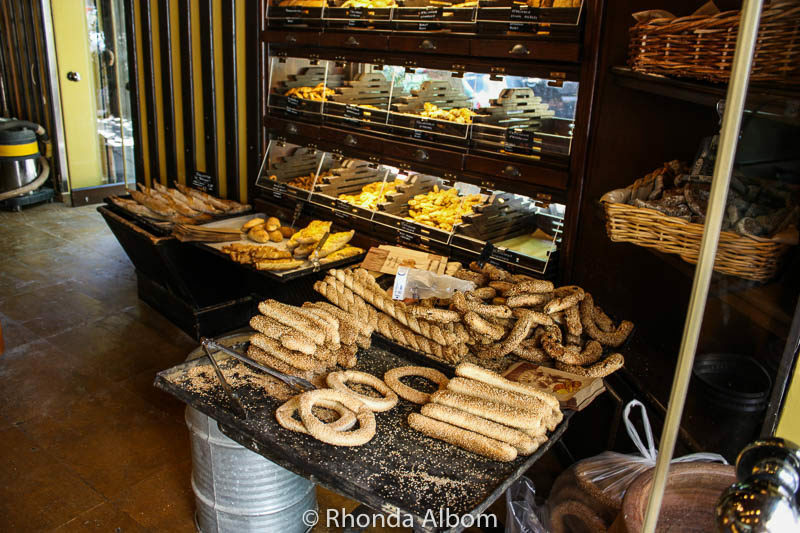 When I think of Athens, I think of history and food. So I think I would go with the day the way you did. I’m not really a huge city person so one day would be enough for me at a time, then maybe go back another time. Greece is definitely at the top of the list for me though! I love the old photo you had from your previous visit – and the photo of your girls on the track! Fun! I was so happy that I have always taken care of photos, so I could find that old photo. Ah, I want to go to Athens so badly! When we lived in Romania, Greece was only a stone’s throw away from us, but at that time we couldn’t travel anywhere outside the borders. Now we have to cross the world to get there and it’s not so easy anymore, but I still didn’t give up hope that I’ll make it there someday. Your pictures are fascinating. On the bright side, you can and do travel now. And, thanks. We were in Athens for nine days. But if we had only been there one day, I would have gone to Plaka, and the main square, visited one of the churches. Eat an authentic Greek meal. Go to the street market with antiques. Oh, and visit one of the islands. But the Acropolis was a major disappointment – and you are talking to an artist here. The pillars are the only thing to see there. In the museum you are nor allowed to take pics. We were planning to spend there a whole day, but in two hours we got bored and left for the city. They may be an overcrowded disappointment, but they felt like a must see to my family who had not been before. Oh my goodness the crowds are too much; but the sights are worth it. I like the old picture versus the new picture of you. Show less crowded in the old old days. You are a lucky person to have been there twice. Good planning. I like at the end what to to and what not to do. As soon as I saw the spot I remembered sitting there all those years ago. I couldn’t believe it was still there. Yes, Greece is filled with photographically beautiful sites. 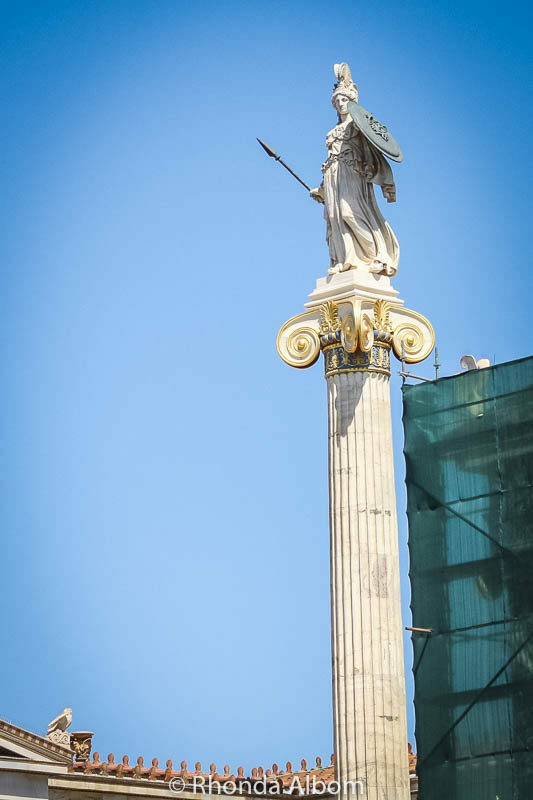 I love the photo where you are pointing up at the columns. This is on my (long) bucket list! So much history, and lovely views too. Thanks. I like the way it seems to give it some perspective. 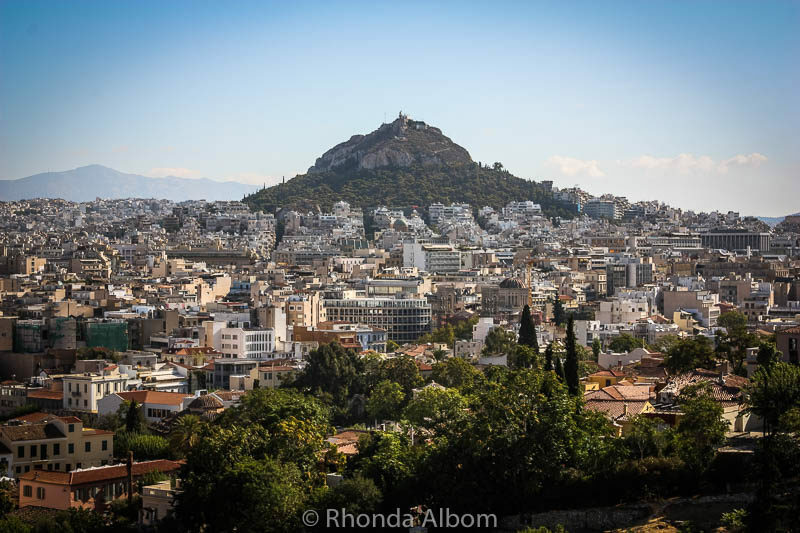 You packed a lot into one day and seemed to capture the essence of Athens. My son really wants to go to Greece. I’m going to save this and share it with him. Thanks Cheryl, that is my goal to capture the essence of a city. I wonder if it will still be the same in another 30 years. I love the art, but it is the architecture that really stole my heart. That was one busy day! Fascinating and fabulous. And exhausting. We slept well that night. What beautiful photos. Thanks for sharing. That is a place that I would love to go to. That’s amazing you got to fit that into one day! WOW! So much history at your fingertips. The secret is having a driver. No wasting time looking for parking, and he is right there at the end of every activity, ready to take us to the next one. Thanks for sharing some wonderful images. I don’t believe that I will ever get to visit Athens and these images are beautiful. Have a blessed day. I am glad you enjoyed my images. Athens is a fascinating city. I would love to go to Athens, but it looks like I won’t get my one day at this point; so I’ll have to vicariously live it through you. Never say never. But I hope you have New Zealand higher on your list than Greece. I wouldn’t care for those crowds, but I haven’t cared for them for many years. Beautiful city and great shots. I agree, there were way too many people there, but it is the only way to see these amazing sites. I hope you can get there too. It’s a wonderful historic destination. Great pictures; looks like you had a blast, short visit notwithstanding. True to both, we had a blast and it was way too short. That is amazing your were there 30 years earlier in a similar photo. Such a beautiful place. If that crowd was beating the crowds, I’d hate to see what it looks like when it’s really busy. I couldn’t believe it when I saw that sideways column still there so many years later. I had to get the shot. And yes, the crowds do get worse. Sarah took that photo of us, long before she took her first photography class. She always had a good eye for photography. It would be hard to spend just one day in Athens! Beautiful photos. You spent your time well. It was a long and busy day, and yes we felt like we spent our day quite well. Wish I have the resources to travel at this part of the world. You packed a lot into one day, I’m impressed. I’ve always wanted to visit the Acropolis! Having the driver made a big difference, as we didn’t have to spend any time looking for parking, or walking distances. I always wanted to go to Athens. How wonderful that you got to revisit the place with your girls! I love Athens. I am sorry I didn’t spend more time in Greece with my girls. We had planned on it, but then we got the last minute cruise deal, and the plan all changed. I am so glad I still have that card from all those years ago. It was fun to pull it out and look at the two together. Always wanted to go to Athens. I was fascinated by ancient Greece from an early age. I still can’t afford a visit to Athens. It’s actually on my plan but my funds aren’t enough yet. I really envy this trip of yours. Anyway, nice photos you got there.